All infrared heaters have one thing in common: they all heat purely by radiation, a direct form of heat that doesn’t warm the surrounding air. Radiant heat requires no additional medium to take effect – the electromagnetic waves of infrared can pass even through a vacuum until they come into contact with a person, object or surface. Convection, on the other hand, requires heat to be transferred to the surrounding air before it can be felt, and the drawbacks of this are clear. Convected heat can be lost through draughts or through the opening and closing of doors, and will quickly disperse outside where the larger volume of cooler air will overwhelm the effects of the heater. Infrared doesn’t use the air to transfer heat, it travels straight through it to provide warmth direct to the end user, which why it’s the method of choice for heating outdoor spaces or open-plan indoor areas that can be difficult to keep warm. One of the chief benefits of infrared heat is that it can be zoned effectively and means you’ll only ever be heating areas that are occupied. They’re by far the more efficient solution over convection heaters, which rely on warming the total air volume of a room – a costly endeavour if you need to warm up a particularly spacious area! You’ll find that out of all the heater types on the market, infrared products are the most varied in their appearance because they’re adapted toward more specific uses. From stylish panel heaters for ordinary household heating, to glowing quartz heaters for outdoor spaces, to discreet ceramic heaters for large and draughty indoor spaces – no matter what kind of space you need to heat, there’s an infrared product to meet every need. Do I need an infrared panel or an outdoor infrared heater? The versatility of infrared as a heating solution means that there’s a lot of overlap in its use, even if some products are designed with a specific purpose in mind. There are times when even an outdoor heater might make a good indoor heating solution, but in what situations might you choose this option over a normal infrared panel? 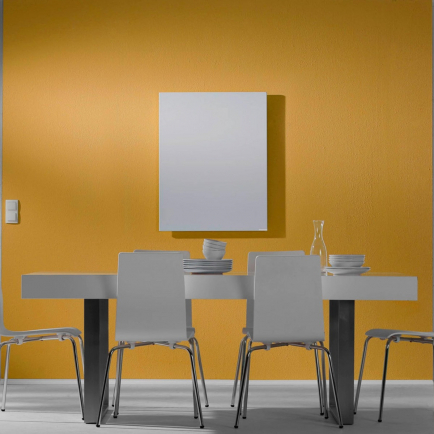 Infrared panels are the products most commonly associated with use in the home. They’re stylish, slimline and come with a range of mounting options to suit every interior. Space them carefully so they cover the entire footprint of the house and they will act just like a central heating system, except with a greater level of efficiency and control. Panels can be especially beneficial in rooms that are difficult to heat – e.g. Victorian terraces with high ceilings and single glazing – because their radiant heat won’t be affected by the larger volume of space. If you’re heating a very spacious interior – e.g. a warehouse or workshop – you’re going to need a product that’s a bit more powerful. Ceramic heaters deliver the same comfortable heat as an infrared panel but offer a slightly higher intensity to combat lower temperatures. They may not look as stylish as panels but their heat is far-reaching and ideal for draughty spaces. It’s not just industrial interiors that can benefit from ceramic heaters; they’re also the perfect solution for areas that need to maintain a higher heat level, such as hot yoga studios. Ceramic heaters provide the optimum balance between gentle heating and far-reaching intensity, allowing them to reach the 40 °C temperatures required for this type of exercise. Their robust warmth also means you won’t need as many heaters to cover the same area as you would do with panels. If you’re heating an outdoor space, you can either use a ceramic heater or a glowing quartz heater. Quartz heaters are better for exposed locations because the heat they give off is even more powerful and better equipped to compensate for the chilling effects of the weather. The warmth they provide is instantaneous and you’ll be able to feel the warming effects of their shortwave radiation the moment they’re switched on. However, if you’re heating a covered outdoor space, you may want to opt for a ceramic product as they’re more efficient over time and produce a more comfortable heat better suited for use over long periods. Why don’t all infrared heaters glow? 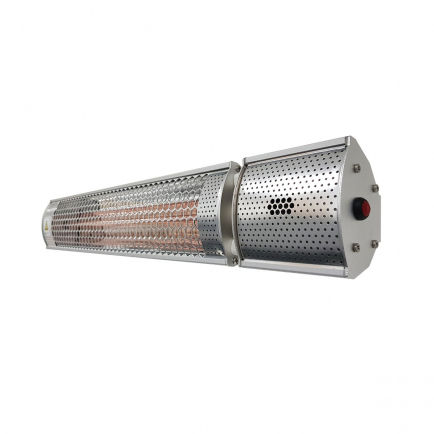 The fiery orange glow of quartz heaters is what makes these products instantly recognisable, their comforting and familiar hallmark becoming a common sight outside pubs and nightclubs. 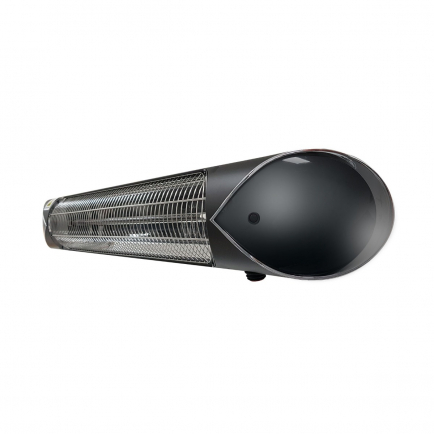 Quartz heaters give off light because they use a different type of infrared compared to panels or ceramic heaters. Quartz heaters use shortwave or near infrared, a more intense form of radiation which is close to visible light on the electromagnetic spectrum. The benefit of this type of infrared is that it feels hotter on your skin – excellent for exposed locations where it has to compete with wind-chill – but your skin actually finds this harder to absorb than gentler wavelengths. This means that for prolonged use, shortwave infrared products are less efficient and less comfortable than longwave alternatives. Ceramic heaters and panel heaters use far infrared, a wavelength which is much further away from the visible light portion of the spectrum, so these heaters do not glow when in operation. This heat feels gentler and will keep you comfortably warm over long periods of time without any discomfort. They do take a little longer to get to comfort temperatures, but once they do, they’ll provide a deeper sensation of warmth that’s pleasant and soothing. The best choice for covered outdoor areas that are occupied for long periods of time. Are infrared heaters cheap to run? Infrared heaters are exceptionally efficient and convert almost 100% of the electricity they consume into useable heat. When paired with additional controllers to reduce energy consumption even further, infrared heaters are one of the most economical heating solutions on the market, no matter whether you’re looking to heat an interior or exterior space. Outdoors, infrared products waste no energy heating the breeze. Rather than heating the air, radiant heat travels directly through the atmosphere until it reaches solid objects. The heat is absorbed directly by people, furniture and surfaces, so no warmth is lost. Unlike with gas heaters or chimeneas, there’s no faff changing canisters or sourcing fuel – which is often more expensive than the reliable stream of electricity from the mains. Infrared products require virtually no upkeep so there are no associated long-term maintenance costs. Indoors, you can save money over alternative methods by zoning. This is a massive money saver in large spaces such as churches and warehouses, because you can direct heat toward busy spaces without having to heat the whole building. You can say goodbye to the fruitless task of persuading a bank of heavy duty convection heaters to heat up all the air in a 20m high chamber. Infrared heat will provide effective warmth no matter the air volume in the room, and with careful placement, you can ensure that the areas you use most are always adequately heated. 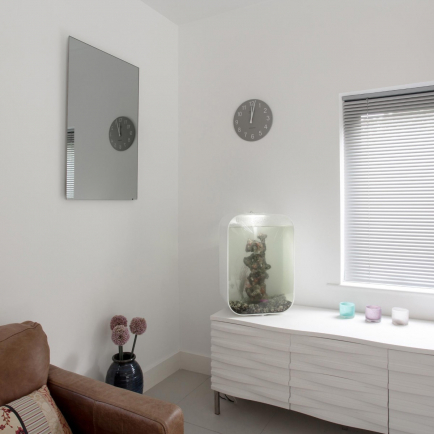 Another benefit of infrared panels for indoor use is that they can be fitted DIY in most instances and will only require an electrician if they need to be hard-wired. Controllers come highly recommended with any infrared installation. Outdoor infrared heaters can benefit enormously when fitted with push-button timers to limit the length of time they stay on for, or dimmers to adjust the amount of heat output and energy your heater will use. Indoor systems can be paired with thermostatic controls which allow users to schedule their heating to come on at set times and restrict energy usage to when it’s needed. Can infrared heaters be installed DIY? This all depends on the heater and the fitting location. Most infrared panels for indoor installation don't come with plug, so you will need to attach one to the cable to install them DIY. You will need an electrician to hardwire the panels if you want to use them in a bathroom, or you prefer a more discreet fitting with all wires hidden. Outdoor heaters must always be fitted by a professional electrician for obvious reasons. Some outdoor heaters do come with a plug if you want the option to use them indoors as a portable heat source, but if you want it outside permanently, the electrician will need to take off the plug and hardwire it into the wall. How can I control my infrared heaters? We sell a range of heating control accessories that empower you to control your heaters in a number of ways. Most infrared heaters have long product lifespans which is why they don’t come with in-built control systems. During the product’s life, control systems can break or be superseded by more sophisticated technology, so manufacturers will often sell controllers as separate units to give you the freedom to change them as often as you need. If the controller goes wrong, you can just buy a new one, rather than scrapping the entire heater. When using infrared heaters indoors, we always recommend thermostatic controls because they can cut energy usage down considerably without any effort from you; the thermostat will simply switch the heaters on and off as needed to maintain the desired temperature. Some thermostats are designed to fit onto individual heaters, whereas others work from a central location and control multiple heaters via receivers. The most advanced of these thermostats can even be controlled over the internet via an app, giving you total control over your heating system no matter where you are. Thermostats aren’t much use outside, because outdoor heaters work by providing a source of warmth to counteract the cold, rather than raising the ambient temperature of the space. But this doesn’t mean outdoor systems can’t be fitted with their own energy-saving measures. Push-button controls, motion sensors, and dimmers can all assist in limiting energy usage and come with their own unique benefits to suit a variety of domestic, commercial or industrial installations. For precision heat management at your fingertips, remote control options are available that can be used to control single units or groups of heaters at a time. This is a question we’re often asked, perhaps because terms like ‘infrared’ and ‘radiation’ can sound a little scary and clinical out of context. However, infrared radiation is just the scientific name of one of the most basic natural phenomena in the universe. The warm glow of an open fire, the heat pulsing out of your body after a long run, the luxurious warmth of the sun on your shoulders on a clear day, the sensation as you hold your hand over a hot cup of tea – these are all common examples of infrared heat at work. All objects in the universe radiate infrared heat to some degree. In fact, your body is emitting infrared heat right now! The warmer the object, the more infrared heat it will produce, and our bodies go through the process of emitting and absorbing this type of warmth constantly. Our bodies’ ability to absorb this type of warmth is one of the reasons infrared heat can provide a much more enduring and pleasant heating sensation than heaters which work by heating the air. We’ve been using infrared radiation as a primary heat source for centuries, from the first primitive fires to central heating radiators to underfloor heating. Any heater that radiates heat is using infrared, so it’s the most common and natural form of heating in the world. What separates infrared heaters from other products is that they solely heat using radiation and not through a combination of radiation and convection. Infrared heating works as the waves radiated from the heat source travel unimpeded to surfaces, objects and people, producing a natural warmth that feels much like the sun on a warm day. This direct method of heating is exceptionally efficient as almost 100% of all energy used is converted into heat. 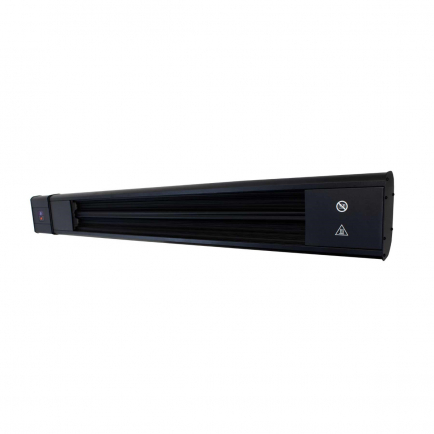 Our carefully selected range of infrared heaters are suitable for a variety of applications – whether it’s a low glare quartz heater used to warm a patio on a cool summer evening, or an industrial no-glare heater required to heat a draughty warehouse. 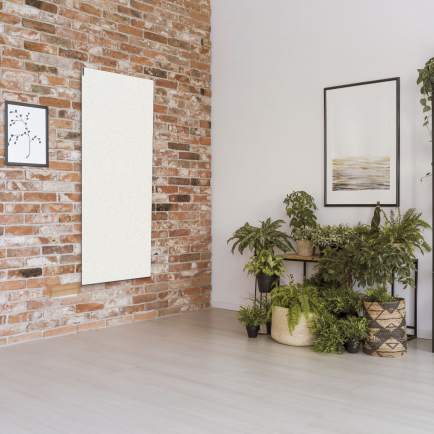 If you prefer a more discreet heating solution, an infrared panel heater can be wall-mounted to blend into a contemporary décor, and you can even choose a mirrored panel which combines two essential room features into one.